Ajahn Vayama guides a half an hour meditation. Ajahn Brahm offers a talk on the development of faith and the benefit of having faith in goodness. Ajahn explains the meaning of faith by using a metaphor of a baby and child and points out how having faith, trust and confidence brings security, comfort, relaxation and peace. Ajahn also discusses how our lack of faith in different areas of our modern society causes us problems. We apologise for the quality of this audio, this Buddha Dhamma talk was given in 1999. 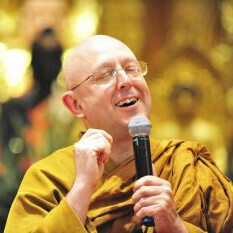 This talk by Ajahn Brahm gets to the heart of the existential quest: What are we here for? What were we born for? Ajahn Brahm gives us the means to practise the art which we call meditation. During these four ‘Introduction to Meditation’ sessions Ajahn expands on the different types of meditation, their purpose and the way to practise them. Part 4 – Ajahn Brahm shares the story of his teacher Ajahn Chah’s answers to the four questions: What is meditation? How do you meditate? Why do you meditate? And what do you get out of meditation? Ajahn Brahm talks about training the mind to become clear and penetrating so that you can understand yourself and your world, which is called insight meditation. Part 3 – Ajahn Brahm shares experiences of the benefits of meditation and explains how to let go of our problems and past and future. We apologise for the quality of this audio. Ajahn continues to talk about how to calm the mind and reduce stress. Part 2 –In this session Ajahn Brahm talks about some of the difficulties you might encounter in mediation, such as the wandering mind. We apologise for the quality of this audio. Part 1 - Ajahn Brahm begins by teaching us to meditate on the breath which he says is used to carry people into very relaxed, peaceful and clear states of mind and is a very old type of meditation used by the Buddha himself. In Ajahn Brahm's first talk for 2015 he talks about both outer space and inner space and what it all means. Believe it or not the mind is naturally still, says Ajahn Brahm. It only moves because we want something or want to get rid of something. Ajahn teaches us how to relax and be kind in order to still the mind. Ajahn Brahm talks about the reasons why the monks live simply and do simplistic retreats and how hard it is in religious life to keep things simple. Ajahn points out this is similar in our world culture, in that we can’t allow things to be, just simplicity and instead we complicate things. Ajahn talks about how we are afraid of simplicity and how we complicate things because we think it will solve our problems. Ajahn Brahm offers a talk on finding ways of creating harmony in this world. Ajahn describes how all we need for harmony in our divided world is to see some commonality which we have, because when we see what we share together and what is in our interest then harmony flows very easily. Ajahn points out that competition is one of the greatest causes of disharmony and offers advice on how we can create a balance between competition and cooperation in order to have a more peaceful and prosperous world. This Buddha Dhamma talk and question and answers session was given in Malaysia during 2005. Change is inherent in all things, but we take stability instead as the truth. Ajahn Brahm explains how if we fully understood the Dhamma, the truth, and the nature of impermanence we would become enlightened. Ajahn says because we don’t want to see it or we think it’s so apparent, we take it for granted and we don’t notice it. Ajahn Brahm looks at the element of impermanence or change in all levels of our experience such as our internal and external world. This Buddha Dhamma talk was given in 1994. You can never know another person, so how can you judge? What’s important is how you relate to others and to know that the only person you can change is yourself. All that matters is what you do now, such as showing kindness, compassion and forgiveness to yourself and others. Venerable Hasapanna explains how Buddhist practise is continual day to day training of the mind through practising; keeping the precepts, living in the moment, mindfulness, stillness, meditation and so on and it doesn’t just happen overnight. In this talk Ajahn Brahm discussed the step by step approach to the blissful deep meditative experiences, known as the Jhānas. This included the basic methods of meditation, hindrances to meditation, the qualities of right mindfulness, the Jhānas and the nature of deep insight. Venerable Vissudha gives a broad Dhamma talk on finding peace in our everyday life. Venerable looks at modern people’s lives and why we experience happiness and suffering. Venerable explains how happiness and suffering are only states of mind and because of this we can train the mind to be peaceful.